Aside from futbol, clubbing, and delicious paella -- Spain's unique cultual skils include creating wine-based beverages that bewilder and confuse the masses. Consider Kalimotxo: equal parts red wine and Coca-Cola. I can tell you from first hand experience, it's surprisingly delicious. 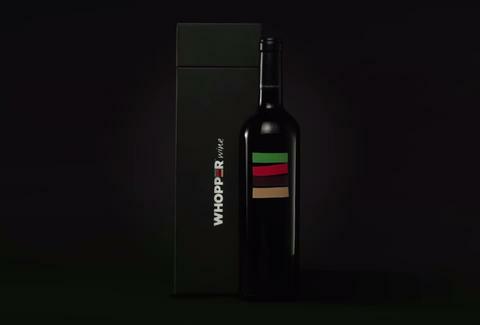 Now, put this in your chalice and drink it -- Burger King's Whopper Wine. Available exclusively in Spain, designed to celebrate 40 years of BK in Iberian peninsula. Yes. This is seriously a thing that actually exists on this planet. As you can infer from this very tastefully-done video, The King wanted the perfect red wine to pair with its world-famous flame broiled Whopper (black, or otherwise)...so they charred some barrels, swizzled some chicken fries around (probably) and called it casked perfection. With fluid ingenuity like this, you can expect Burger King to reign in Spain for another 40 years, at least.